Pancreatic cancer is one of the tumors with highest mortality. In the past, it’s very difficult to treat pancreatic cancer in middle and late stage. Even worse, there is nearly no hope for the inoperable patient that they can just have palliative chemotherapy. Many pancreatic cancer patients have to give up treatment in middle and late stage. Now, nanoknife ablation brings a new hope for these patients. 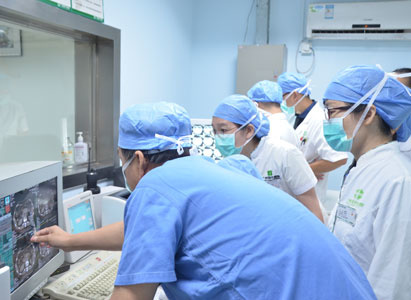 In June 4, 2016, Modern Cancer Hospital Guangzhou completed the first case of nanoknife which was performed under CT guide and general anesthesia to ablate pancreatic cancer. It was carried out by the specialist team from Modern Cancer Hospital Guangzhou, headed by Director Bai Haishan. Li Xingde (aliases) from Indonesia, was diagnosed with stage 3 pancreatic cancer, tumor size 4.5×4cm, with the symptoms of abdomen distension and pain. According to previous experience, due to special anatomical location of pancreas, operation not only has high risk but also can’t remove tumor completely. Besides, pancreatic cancer is not responsive well to chemotherapy and radiotherapy. In this situation, nanoknife just makes up the short board of operation with advantage of destroying membrane structure by electrical current, leading to instant death of cells and minimizing damage to surrounding critical tissues such as blood vessel, duct, nerve, etc. It’s a major breakthrough in treatment technology and brings a new hope for patients with middle-late stage pancreatic cancer. Therefore, after joint consultation of Multi-Disciplinary Team (MDT) from Modern Cancer Hospital, they decided to apply the most advanced technique nonaknife to Li Xingde. The performance started at 10:15am on June 4. After carried out the well-detailed plan of anesthesia, patient was under non-invasive arterial pressure monitoring to stabilize patient’s blood pressure and heart rate so as to ensure patient was in deep state of general anesthesia during the whole the procedure. Meanwhile, a meticulous puncture plan was made out under the CT scan precise guide. 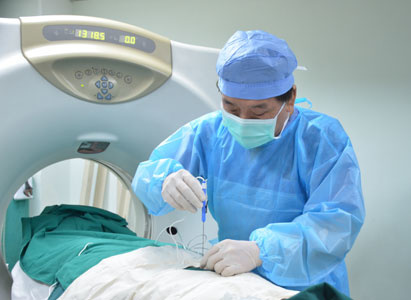 Director Bai Haishan, who has thousands of cases of puncture experience, precisely strategically placed five 1mm electrode probes around the tumor one by one. And then technical engineer calculated the electric field intensity of tumor and the best range based on the tumor size detected by ultrasound. 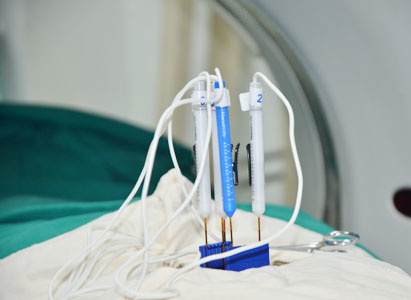 At last, five electrode probes delivered electrical pulses to electrocute tumor which can be finished within a few minutes. After treatment finished, patient’s condition was good without any complication, and he can walk after 72 hours. Director Bai Haishan pointed out that nanoknife technique applying in clinic these years has brought hope to pancreatic cancer patients. It enables patients with inoperable condition to achieve a chance of radical therapeutic effect. “Especially for those tumors adjacent to main blood vessels, doctors can’t do anything in the past. Patients always can just passively wait for the fate. 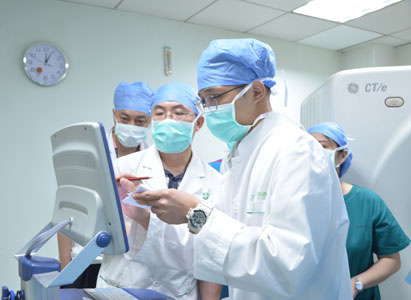 But now, these small probes can effectively avoid surgical risk.” The successful completion of the first case of nonaknife ablation means Modern Cancer Hospital Guangzhou has added one more characteristic of minimally invasive technology while maintain the original advantages of advanced techniques. The hospital brings in this technique and sends new hope for the patients with middle and late stage pancreatic cancer.